Please add a filter to avod hair or dirts being clogged with in this pumps. if our pump does not working properly, please try to open and clean it before sending back to us,thank you very much! 1. Working at rated voltage (DC12V/0.35A). The positive pole is red wire, the negative pole is black wire/blue wire. 3. When blocking, long-running is not allowed. 4. Preventing any hard particles entering the pumps. For the Water fall,Water feature & Water foutain in Home & Garden - Would make a nice fountain pump for a display,Can be powered by solar pannel( need to add a constant-voltage controller yourself) , or power it by 12 Ac power adapter,please Search ASIN (B0713T89R1) for the power adapter. 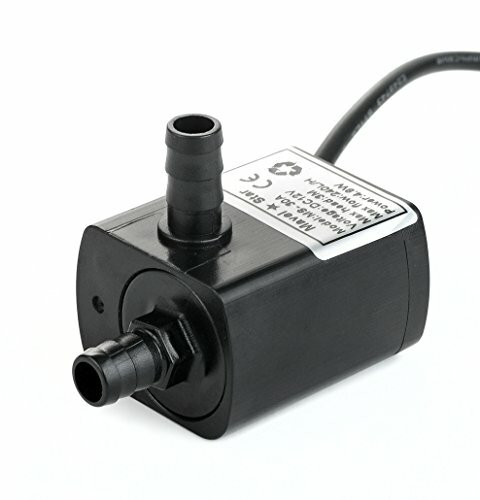 For Your Bucket Swamp Cooler - This little Pump Would work like a dream for DIY Bucket Swamp Cooler ,power it by 12 Ac power adapter,please Search ASIN (B0713T89R1) for the power adapter. If you have any questions about this product by Mavel Star, contact us by completing and submitting the form below. If you are looking for a specif part number, please include it with your message.